Identification. Chad is a vast, ethnically diverse African country. It gained independence from France in 1960 after a sixty-year colonial period rule that did not create a meaningful national unity. Within the country's borders one may distinguish several national cultures that are based on the ethnoregional and religious affiliations of the population groups. Many of the cultures can be traced back to a complex precolonial history of competing indigenous states and sultanates. 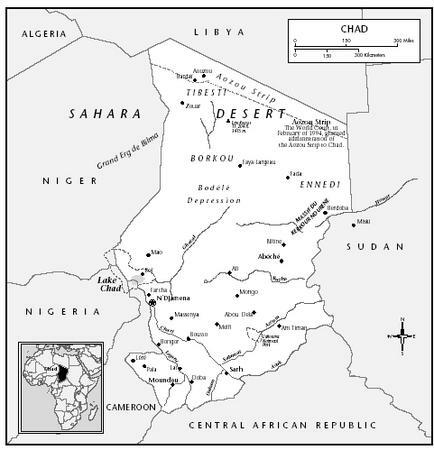 The name Chad is derived the from designation of the great Lake Chad (originally called Kuri) by the sixteenth century author and imam Ibn Fortu. Chad is somewhat similar to Sudan in that it has a northern part inhabited by an Islamic (and partly Arabic-speaking) population of pastoralist semidesert peoples, and a southern part of Christians and traditional religious people, engaged in mixed agriculture, crafts, and trade. These two parts each comprise about half of the population. Postcolonial Chad has, like Sudan, been marked by deep regional-ethnic divisions and a violent history of struggle for power among the various elites that have alternative visions of the state and their place within it. Armed rebellions and years of protracted and destructive civil war, in which the role of Libya was at times notable, have characterized Chad's recent history. Starting in 1993, the armed conflicts subsided and some sort of democratization process was instigated. Location and Geography. Chad is a resource-poor, landlocked country, bordered by the Sudan, the Central African Republic, Cameroon, Nigeria, Niger, and Libya. It has an area of 495,752 square miles (1,284,000 square kilometers), most of it desert, semidesert, or savannah. In the extreme south there are lush forests and agricultural areas. The country is divided into three climatic-ecological zones from north to south: the Saharan zone (dry and hot, with livestock raising, minor cultivation, and some trade), the Sahelian zone (more rainfall, livestock raising, and cereal cultivation), and the southern semitropical zone (with good rainfall of up to 48 inches (1,200 millimeters) per year, large-scale cultivation, cash-crop production, trade, and crafts). The country is drought-prone and suffers from periodic famine. Chad is basically a large plain, with some mountain ranges, including the Guéra massif in the center and the Ouaddaï or Ennedi massif in the east; in the north in the middle of the desert lies the spectacular Tibesti range, where cultivation is possible due to higher rainfall. In the southwest, on the border with Cameroon, Niger, and Nigeria, is Lake Chad, a shrinking water mass lying at an altitude of about 790 feet (240 meters). The two main rivers—the Logoni and the Chari— are in southwest Chad and run into Lake Chad. They are navigable for most of the year and are also used extensively for fishing. annual population growth rate is 2.5 percent. About 90 percent of the population lives in the southern 15 percent of Chadian territory. Linguistic Affiliation. There are more than 100 languages spoken in Chad, virtually all belonging to two great languages families: Nilo-Saharan and Afro-Asiatic. The precise extent and variety of the linguistic situation are not known, because of a notable lack of research. Language does not overlap with "ethnic group" identity, as some languages are spoken by groups identifying themselves with different ethnic/regional labels. Arabic, Sara, and French are widely spoken, the latter used in education and the administration, especially in the south. The use of Arabic, traditionally an important commercial language, is expanding across the country. Symbolism. The main symbol of Chad is the national flag, consisting of three vertical fields of blue, yellow, and orange-red, without any figurative decoration. Additional national symbols are not known, although various parties and rebel fronts have used their own flags. Emergence of the Nation. Chad did not exist as a political unit before the French conquest of 1900, but was an area of important indigenous state formation and had seen Arab immigration (of groups collectively called Djoheina and Hassaouna) and Islamization since the fourteenth century. There was a conglomerate of kingdoms (such as Bagirmi and the pre-Islamic state of Kanem-Bornu), chiefdoms and sultanates (such as Ouaddaï and Tama) of varying size and ethnic composition; amongst these states, war and raiding were frequent. The descendants of these states in the north and east are today's seminomadic pastoralist peoples and cultivators in the northern and central parts of the country. Southern Chad is inhabited by a variety of ethnic groups that, although culturally related, traditionally had no strong centralized polities. The largest group among them are the Sara, although they themselves form a combination of twelve "tribal" groups that never showed any strong unity. Other groups are the Mundang, the Massa, and the Mbum. The southerners were the victim of a tradition of slave raiding by such northern groups as the Barma, Fulani, Bagirmi, Tubu, and Maba; this has left deep scars in the fabric of Chadian society. It was because of the promise to end slave raiding (and the killing of the notorious warlord and slave raider Rabih az-Zubayr, who was of Sudanese origin) that the Sara peoples welcomed the French colonists in 1900. Under French colonial rule, the southern part of the country received most of the attention in the domains of economic and educational investment, and many people there converted to Christianity. The Islamized north, seen as a vast expense of inhospitable desert with little productive resources except livestock, dates, and some cereals, was mistrusted and relatively neglected, and people there kept more to their "traditional" ways in a cultural and educational sense. In the first decade of Chadian independence the northerners also remained relatively excluded from national politics; Northerners have had the upper hand in Chadian politics since 1979. It must be kept in mind that, before colonization, the "north-south" divide, so often referred to now, was nonexistent in Chad. In 1960, when independence was granted by France, Chad had no "national identity" recognizable to the population at large. Ethnoregional traditions formed the framework for group identification, with the "nation" only as an abstract concept. Southerners (who were the first to clamor for independence) formed the state elite, but did not succeed in building a representative or democratic political system. Rebellion in northern regions emerged, notably that of the FROLINAT (National Liberation Front) movement in 1966. The civil wars of the 1970s and 1980s, though resulting from exclusionist state policies, authoritarianism, and divergent views on the role of the state, fueled group tensions. But despite these divisive conflicts and the opposition between the north and the south, there seems to be no great desire on either side to split up the country and go it alone, except perhaps in a federal arrangement. There is the constant danger that the perceived ethnoreligious and territorial divide between the Arabized "Islamic north" and the "Christian south" will solidify into a polarization between the two (although the post-1960 civil wars were not fought on the basis of religion). This would fuel rivalry even more and inhibit the emergence of a democratic system based on equity and resource sharing. There is a basic, perhaps unsolvable, contradiction between the identity and aspirations of the south and those of the north, although both regions have their internal divisions as well. In the late 1960s, when the southerner N'Garta (François) Tombalbaye was president, there was an effort by his government to create cultural "unity" between the various groups of the south vis-á-vis the north. This was done by making it obligatory for all people holding public office (at some point even Muslims) to undergo an initiation ritual based on the Sara ethnic tradition. This "cultural revolution," however, became a violent and intimidating exercise that completely failed and even antagonized many southerners. In the years of the regime of Hissen Habré (1982–1990), there was suppression and terror in the south, perpetrated by northern-dominated government forces. This created the fear that southern rights and identity would be trampled. There is often talk of a "superiority complex" of northern people vis-á-vis the south. One of the domains where the north-south tension is now becoming apparent is education, where the government (emanating from the northern and eastern Islamic groups) is urged to further Islamic orientation. While Chad is still a "secular state," the rivalry between the faiths and the strengthening of Islam in public life may become another threat to long-term stability. National Identity. Chad's national identity is precarious, and first and foremost derived from the inherited postcolonial administrative state structure. Constitutionally, Chad is unitary and secular, but in recent years a struggle has occurred to redefine the identity of the nation. In the wake of the civil war that ended in 1990, contrasting views on what kind of nation Chad can, or should be, are emerging. Core issues are the roles of ethnic traditions, religious identity, and balanced ethnoregional representation in the state apparatus. The issue of how this would have to be reflected in the nation's legal system has not even been posed. Language policy also reveals the problems: French and Arabic were chosen as the official languages of the state— both long established in Chad but neither of them indigenous. Ethnic Relations. A relatively understudied subject, traditional Chadian society—in all its ethnic and religious variety and complexity—is not well-known to the outside world. Little recent field research has been done in either the countryside or the urban areas on the various societies and diverse ethnocultural traditions. One could say that group relations have suffered from the burden of longtime slave raiding (formally ended only in 1926) and communal political violence. Peoples with no particular affinity toward each other are bound together in a state that was largely externally created and not the outcome of local political processes. There is therefore a continuous challenge to create patterns of cooperation and a durable society in the midst of regional and ethnic (and increasingly religious) antagonism. Violent insurgency and rebellion were until recently the prime means used to establish political power of one group over the others. The question is whether a resilient state can come out of this process. In this respect, the long-term problems of Chad may be as serious as those of Sudan, because some groups do not feel deeply committed to the nation as a whole nor to other Chadians as partners in the venture of developing an inclusive polity. The Sara, initially dominant, are now a disenchanted group because they see their rights and identity being threatened. It is likely that ethnic relations in Chad will benefit from a decentralization of the political structure that retains unity in diversity. When the rights and regional interests of the various ethnic groups are respected, few groups will desire to dissolve the state except some diehards of the north. The rate of urbanization in Chad is low, with most of the people still living as cultivators and pastoralists in dispersed hamlets, cattle camps, villages, and oases. Old capitals of the sultanates and kingdoms (for example, Njimi, capital of the Kanem kingdom, Wara of the Ouaddaïsultanate, and Niere of the Tama sultanate) have dwindled in size and few historical structures remain except for some palaces and mosques. There is a significant variety of building styles, use of space, mobility patterns, and material culture across the ethnic groups and climatic conditions. In the countryside, the traditional house- and hut-building styles are maintained, although the construction of corrugated iron and concrete buildings has rapidly expanded. In the sparsely populated north, with its vast expenses of desert plains, distances are great between pasture areas and human settlements. Several nomadic groups live in tents and shelter structures. The sedentary cultivators in the south live in villages and have a much higher population density. Abéchéis perhaps the most characteristic town of Chad, with its clay buildings, monuments, and small winding streets. The capital N'Djamena is a new town, founded by the French in 1900 as Fort-Lamy. It suffered huge damage in the 1980–1982 war instigated by Hissen Habré. Because of continuous immigration and the influx of refugees from the civil war period, the city has grown rapidly without a proper expansion of services and infrastructure. Food in Daily Life. Patterns of food production and consumption are rather diverse across the various ethnic groups. There is no shared "national food culture," although the one dish fairly common throughout the country is a kind of set grain porridge, made of sorghum or millet flour, served with sauces that contain meat, dried fish, tomatoes, onions, and good spices. Some north-south divide is apparent in food traditions. In the south (in contrast to the north) there is no fish in the diet, and there is less consumption of milk products from livestock herds. The diet of southern peoples also shows more variety in the forest products, tubers, spices, and fruits that are consumed. Staple foods, apart from sorghum and millet, are maize, manioc, potatoes, rice, sesame, and some bean species. A woman dressed in traditional clothing, sits on the floor of her more modern, concrete house in Chad. Basic Economy. Chad is one of the poorest countries on the African continent. The great distances and poor infrastructure have hampered the development of a national market and a nationwide, shared food economy. Local communities outside the cities are largely self-sufficient in food production. Commercial food production is concentrated in the South. Chad has a thoroughly agrarian economy, with about 40 percent of the workforce engaged in livestock herding, 40 percent in agricultural production (including cotton farming), and the rest in manufacturing, services, and the military. Most of the economy is geared to subsistence cultivation (including sorghum, millet, groundnuts, vegetables, and fruits) and livestock raising. About 40 percent of the gross domestic product is generated from agriculture, and approximately 18 percent from the livestock economy (which includes cattle, goats, sheep, and camels). Because of political problems, violent conflict, an almost nonexistent infrastructure, and the lack of a national government, there was hardly any attention given to development-oriented, long-term economic strategy during the last three decades of the twentieth century. The potential of the country, however, is great: there are good chances for the development of cattle herding (on the large central grass plains), mineral deposits, commercial farming, and oil production. Chad is still strongly dependent on foreign aid, especially from France, which supplies on average about 30 percent of the national budget. Land Tenure and Property. Most of the land is held in communal tenure, especially in the pastoral north, although the state has the final claim on all land in Chad. A claim on land was traditionally established by the person who started developing and cultivating it. Customary law according to local tradition is important everywhere in settling land claims and disputes and allocating access to resources, such as fishing places, pasture, date groves, and water holes. In the cotton-producing south, a class of entrepreneurs has concentrated much land in its own hands. Property law in Chad is underdeveloped, and the judicial system does not apply everywhere because of a lack of courts and manpower. In the areas of the old kingdoms and sultanates, much landed property is still owned by old aristocratic families. In the cities there is a private property market. Big traders and well-placed government people have acquired substantial pieces of property over the years. Commercial Activities. Chad has a narrow commercial base. Since independence, both Chad's internal and external markets remain undeveloped; the nation never succeeded in developing a successful commercial export economy. Persistent structural deficits of up to 30 percent of the national budget have been common. Following the period of turmoil and civil conflict, an increase in commerce with Sudan, Cameroon, and other neighboring countries has become essential for Chad to further develop its economy. Cameroon will most likely be the link to the sea for future Chadian exports (notably oil). There are plans for a pineline and a railroad from Chad to the Cameroon coast. With its varied landscapes, ruins of ancient capitals, and spectacular scenery in the central and northern parts of the country (such as the Tibesti Mountains), Chad has significant tourism potential. The number of annual visitors, however, is minuscule (seven to eight thousand), resulting in little impact on the national economy. Major Industries. Industries in Chad are very limited in number and size, and are all located in or close to N'Djamena. The largest one is cotton production. There is also a large oil refinery. Minor industries include the production of beer, cigarettes, textiles, and natron (a mineral), as well as the processing of sugarcane and meat. New industries could develop around the exploitation of resources such as gold, uranium, kaolin, bauxite, or tungsten, although exploration has not been sufficiently carried out because of the past civil wars. In the 1970s, oil was struck in Kanem, near Lake Chad. Production started in 1977, allowing Chad to develop a rate of fuel self-sufficiency of 75 percent. In the 1980s and 1990s new finds were made in the south, such as near Doba. Oil exploitation in the south started only in 1998 but is eventually expected to have a major impact on Chad's economy, assuming that the country as a whole benefits from the proceeds. There is tension emerging about the appropriation of oil proceeds between the northern-dominated elites and the southern peoples on whose land the oil was found. Trade. Historically, Chad was at the crossroads of major long-distance trade routes such as the Trans-Sahara caravan route to the Libyan and Egyptian coast, to the west, and to the east (into Sudan). Goods traded included slaves, gold, cattle, ivory, arms, and textiles. The kingdoms of the Middle Ages partly emerged on the basis of their establishing control over the southern end of this trade line. Under French rule, much trade was redirected through the south, into Cameroon. In the twentieth century, Chad's trade position steadily declined, the only major trade items being cotton and livestock. Food imports are very limited, except in times of drought. Raw cotton generates over 65 percent of export revenues, while livestock exports account for another 20 percent of revenue. Minor additional exports are dates, rice, meat, gum arabic, and natron. Classes and Castes. In modern Chad, social stratification is seen in the emergent class of big traders, landowners and government people (who invest in property, industry, and livestock keeping); the large majority of common peasants and pastoralists, fighting for survival with little means; and a small but vocal urban working class of some sixty thousand. There is no clear-cut division of elites according to regional provenance; for example, the elite does not consist only of northerners. Since the 1970s, membership in a successful armed movement could serve as a way to social advancement, since the resources of the state were then within reach. Many societies in Chad traditionally have different low-prestige occupational castes, such as hunters, potters, tanners, and blacksmiths ( haddad ). There are also groups of slave descendants that live in pockets of the north, such as the Kadjidi near Lake Chad, and the Kamadja, who form relatively self-contained communities and do not inter-marry with their Tubu masters/employers. A similar group in the south are the Yalna in the Salamat region. Modern education, social change, and the mobilizing effect of the armed movements have partially invalidated traditional prejudices and divisions relating to caste membership. Symbols of Social Stratification. Stratification is evident in wealth differences, dress style, leisure activities, and location and style of residences. Children and adolescents rarely pursue a complete education in Chad. 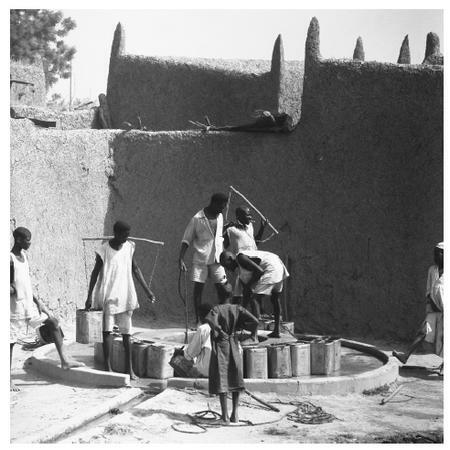 These young men and boys are helping their households by drawing water from a well. including one by the National Liberation Front (FROLINAT), founded in 1966. In a 1975 coup, Tombalbaye was killed and General Félix Malloum took over. He did not stem the tide of revolt, and was forced out of office in 1979 by FROLINAT, led by Goukouni Oueddei and Hissen Habré. In 1982, after three years of social unrest and armed struggle led by local warlords, President Oueddei was replaced as head of the government by his former comrade Habré, who was supported by France because of his campaign to kick the Libyans (who were supporting Oueddei) out of Chad. A period of repression and abuse followed, however, with many casualties in the south. Northern groups also came to resent Habré's heavy-handed, authoritarian approach; they supported the guerrilla war started by his former ally (and rival) Idriss Déby in April 1989 that culminated in the defeat of Habré's government forces twenty-one months later. Under the Déby regime, which took over in 1990, an effort was made to set up a new type of republican government, with all the trappings of a democratic system. A two-chamber parliament consisting of the National Assembly and the Senate was set up. A High Court and a Constitutional Court were also installed. More political parties were allowed (although recruitment on a religious or ethnic basis was prohibited), freedom of the press and of organization was accorded, and multiparty elections were promised. At the same time, there was never any doubt that Déby would maintain a tight hold on the reigns of power. Suppression of occasional insurgencies and massacres by government forces of members of suspected opposition groups have marred the transition to a secure democratic political system. Nevertheless, the groundwork for democratic institutions was laid, and there is still a possibility that a better system of inclusive governance may entrench itself. Leadership and Political Officials. A new National Assembly was elected in 1997, in relatively free multiparty elections. Among 49 parties, Déby's MPS party (Patriotric Salvation Movement) won, gaining 63 of the 123 seats. The major opposition party is the Union for Renewal and Democracy (URD), led by the senior southern politician W.A. Kamougué. Another opposition party is the National Union for Development and Democracy (UNDR). Some armed movements (like FNTR and MDD) are still active, showing that the use of force to press political claims remains an option in Chadian life. The maintenance of political power is a balancing act, based on neo-patrimonial principles of cooperation and the monitoring of personal loyalties and in which the meting out of positions and privileges, in an often informal manner, is crucial. Social Problems and Control. Chad's many social problems include widespread poverty and displacement of people, ethnic and social group tensions, poor education and health care, and the orphans and broken families that have resulted from the devastating civil conflicts. There is still a sense of insecurity in many areas, reinforced by the spread of small weapons. Common criminal behavior includes banditry and road robbery, and in the cities, theft and burglary; many young men from the rural areas who were active in the armed rebel groups have had trouble in adapting to civilian life and have therefore turned to such crimes. There is also a substantial informal (non-taxpaying) economy on which the government has no hold (but from which it also profits). Corruption is still widespread. One underestimated problem aggravated by the civil wars and the resulting social and economic crises is environmental damage, most notably the rapid decline of the country's trees, forests, and wildlife. Military Activity. In Chad's political system, the military and the use of armed force in general have played a crucial role in establishing power. Violence was the chief political means with which claims to hegemony in Chadian politics were established. (The only president ever voted into office since 1960 was the first one, Tombalbaye.) The current president, Déby, though elected in 1995, came to power in 1990 by the force of arms, and support of the reformed national army (ANT) is important in ultimately securing his power base. There are currently various small-scale rebel groups, but they do not pose a serious threat to the national government and its army. One of the challenges for the Déby government is to broaden the recruitment base of the army and make it more representative of the country's various population groups. Chad has never had a real national army that was independent of political struggles and insurgent movements. The national army under President Déby (ANT) numbers about thirty thousand men. There is also a 5,500-strong Republican Guard who are the elite troops of the Déby regime and are under his personal command. France maintains a small military presence as well. Tibesti in the north (the former stronghold of Oueddei) is still an insecure area, not fully under government control. It is also made unsafe because of a large number of land mines left by the Libyans when they occupied the Aozou Strip from 1973 to 1994. These are conspicuous in their absence. A government without funds and social programs has forced citizens to rely on their own resources, though some are occasionally assisted by foreign (many French) nongovernmental organizations, such as Doctors without Borders and various missionary organizations. Islamic and Christian as well as some ethnic associations of self-help also exist. 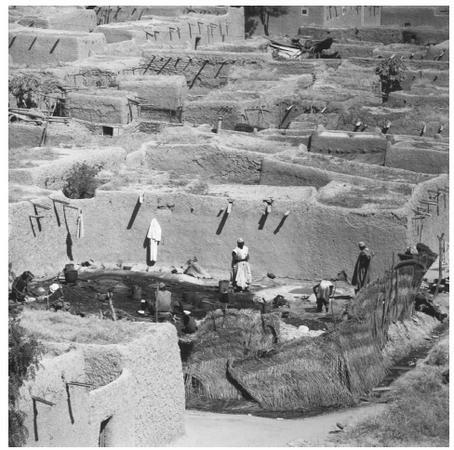 Blacksmiths' workshop in the town of Fort Lamy (now N'djamena). Blacksmithing is considered a "low-prestige" trade in Chad. rights organizations play a substantial public role by monitoring the abuse of both government forces and rebel movements, and by maintaining diplomatic contact with Western donor countries. Division of Labor by Gender. Men predominate in government, the military, and public life. Political life (including insurgency) is almost exclusively the domain of men. The pastoral economy and commercial farming are dominated by men as well. Women do the main work in the rural subsistence economy across the country, handling family responsibilities and household tasks, including child care. They also care for small livestock, tend family gardens, and are involved in the small-scale trade of agricultural surpluses. There is also an emerging small group of female traders in the urban centers. Women are not, however, significantly organized in public associations. The Relative Status of Women and Men. Men's status is seen to be higher than that of women, but this is related to conceptions about religious roles and public functions, not necessarily to ideas of inherent inferiority. There are some differences across the country's regional or ethnic groups as to the status and roles of men and women in social and religious duties, but in practice, women are economically active and freely move about in most spheres of life, although the northern Islamic groups are more conservative than the southerners and city people. There is, however, no Islamist discourse that limits the social role of women or forces them to go veiled. The new 1996 constitution accords many more rights to women, though practice lags behind. Marriage. Polygyny (the taking of more than one wife) is known among both the southern peoples such as the Sara and the northern Islamic groups. Bride-wealth payment is also common among most Chadian groups. Domestic Unit. Nuclear families independently living their own lives are rare except in the towns. The effective social unit for most Chadians is an extended family or joint family of married brothers. Inheritance. Patrilineal systems of inheritance predominate in the country, modified by modern, French-inspired law as well as by Shari'a (Islamic law) in the regions where Islam is important. Kin Groups. The framework of clans is of great importance to most Chadians, be they northerners or southerners, though clans are of declining relevance in the towns. Kinship determines people's social and cultural allegiances. Political affiliation tends to follow ethnoregional lines. This was reinforced in the course of the past civil wars. Lineage and clan membership is important among the pastoralists, such as the Tubu; and in southern village societies, such as the Nar and the Tupuri. Such membership, however, does not subvert the importance of individual agency, much cherished among Chadians. 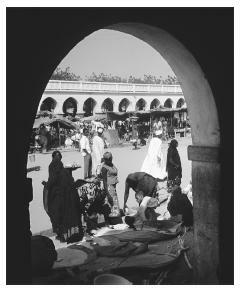 People buying flour at a market in the town of N'Djamena. duties, mutual help, and social support. Children necessarily remain dependent on their families until their early twenties. About 60 percent of Chadian children attend primary school, but the literacy rate in Chad is estimated at only 20 percent, a comparatively low rate within Africa. Further formal education is pursued by a minority, and most children are educated by their families, taking on domestic and economic tasks in their early teens. After decades of neglect because of civil conflict, isolation, and neglect, education, particularly Islamic education, is expanding among the peoples of the north, although its quality leaves much to be desired. Koranic schools in the north and east have existed for a long time but they have a very limited curriculum. Higher Education. Higher education is seriously underdeveloped in Chad, except for the small and underfunded University of Chad, founded in 1971, and some technical-administrative colleges, such as the Ecole Nationale de Télécommunication in Sarh and the Ecole Nationale d'Administration in N'Djamena. The university was often closed due to civil war and the resulting damage to its facilities. Chad's economic and demographic base is too narrow to sustain a good higher education system. Many young people go to France or other French-speaking West African countries for further education. Chadians, being of quite different religious and cultural backgrounds, do not observe a common standard of etiquette except that respect for community elders, moderation, and reserve in public life is universally appreciated. Some groups are very sensitive to verbal abuse and insult, which can lead to serious personal conflict. Traditional community standards and values are in decline, since in the past decades social life has been subverted by civil war and communal conflicts, which in turn allowed violent behavior to be an acceptable mode of expression for many young people. Religious Beliefs. Two religions predominate in Chad: Christianity and Islam. About half of the population, and particularly in the northern and eastern parts of the nation, follow Islam, while some 30 percent are Christians, who are concentrated in the south and among formally educated people. A further 20 percent, mainly in the south, adhere to traditional religions, most of them not well known. Across the spectrum, traditional local beliefs and cults are important, often in conjunction with one's allegiance to the Islamic or Christian faith. Ancestor veneration, belief in certain spirits, use of oracles and divination, and ideas of fertility and cosmic harmony are central. The discourse of "witchcraft" is not prevalent in Chad as compared to, for instance, central and southern Africa. Despite the southern peoples' association of Islam with slave raiding and violence, communal-religious relations between Christians and Muslims has historically been characterized by mutual tolerance and cooperation. Indeed, in Chad's civil wars, religious antagonisms never played an important role. Islam in Chad also has a very diverse character. There is no strong basis for Islamist "fundamentalist" movements in Chad, although some groups of this nature exist. Missionary groups of both Islam and Christianity are active in Chad. Conversion is an ongoing process, but the use of pressure or force is rejected. The public role of traditional religions is very limited, that of Christianity and especially of Islam is much more visible. Religious Practitioners. The Imam of N'Djamena is the spiritual leader of Chad's Muslims. The Catholic archbishop, also residing in the capital, heads the country's 550,000 Catholic believers. Islamic Sufi orders such as the Tijjaniya and the Sanusiyya are popular in northern and central Chad. Traditional religions in the south have their own ritual leaders and practitioners. Rituals and Holy Places. Apart from the rites and ceremonies central in Islam and Christianity, there are important initiation and healing rituals among many ethnic groups that define their cultural tradition and personal identity. These have strong localized character. Islam and Christianity in Chad have no specific holy places (such as graves of saints or pilgrimage centers) that attract a nationwide or cross-border audience, but the number of mosques and churches is on the rise. Death and the Afterlife. Adherents of both Christianity and Islam believe in an afterlife in Heaven or Hell, with the deceased to be resurrected when God so decides. Traditional religions also cherish the idea of a life after death, as evident from the beliefs in the continued presence of ancestors, and the presence of the dead in dreams and in spirit form. The diversity and complexity of the southern traditional religions in this respect is far from explored. 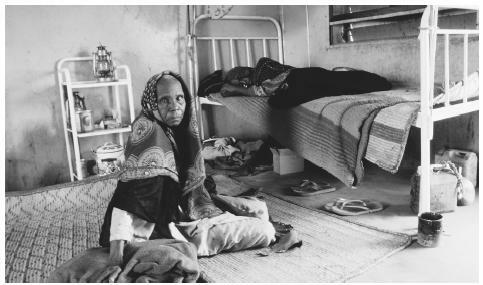 Due to an underdeveloped and neglected state health-care system and the absence of alternatives in the private sphere, Chadians are mostly dependent on basic primary health care and polyclinical aid and, especially, on traditional medicine. In the larger towns, such as N'Djamena, Sarh, Moundou, and Abéché, there are hospitals, but with very poor facilities. There is one doctor per 38,000, a very low ratio. Prevalent tropical diseases are malaria, schistosomiasis, and river blindness, especially in the south. The north often has suffered from drought and famine. The annual national holiday is Independence Day on 11 August. Major Christian and Muslim holidays are recognized by the state as public holidays. Support for the Arts. There is no government support for the arts, except if one considers the maintenance of the small Musée National as such. Some individual artists have galleries in N'Djamena. 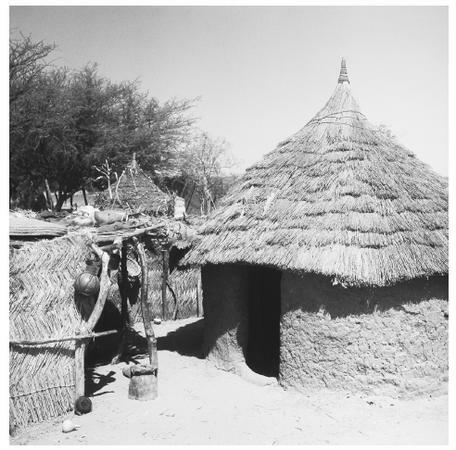 A traditional mud hut stands in the village of Massaguet, but modern, iron-and-concrete buildings are being built more frequently throughout Chad. Literature. The various ethnic cultures have their own traditions of oral literature, including narratives, epics, and ritual drama. Literary creativity of Chadians is notable in the diaspora community in France, but less so in Chad itself, where market demand and the conditions for a literary culture are very limited. Languages of literary expression (in poetry, novels, memoirs, and theatre) are French and, to a lesser extent, Arabic. Graphic Arts. Various ethnic groups in the country have their distinct artistic traditions related to the decoration of houses, clothing, leatherwork, and artifacts. Modern graphic artists are few and are located in the capital of N'Djamena. Performance Arts. Performance arts in theaters are virtually nonexistent; traditional religious and other rituals, however, are alive and well in both the south and the north, as part of the everyday cultural life of the Chadians. Not much is known about the remaining traditional material cultures of the various ethnic groups. The sciences have only a token presence in Chad. Lack of funding and institutions and the stagnating effect of the civil wars have long inhibited any development of the scientific research and teaching. The University of Chad has only about seventeen hundred students and has to make do with a library of fourteen thousand books for all fields. The Chadian National Institute for the Humane Sciences has only six researchers and a library of one thousand books. Finally, there is a Veterinary Research Center and a Cotton Research Center. Azevedo, Mario J. Roots of Violence: A History of War in Chad , 1998. Azevedo, Mario J., and Emmanuel U. Nnadozie. Chad: A Nation in Search of its Future , 1998. Buijtenhuijs, Robert. Le Frolinat et les guerres civiles au Tchad; 1977–1984: La Révolution introuvable , 1987. ——. Transition et élections au Tchad, 1993–1997: Restauration autoritaire et recomposition politique , 1998. Centre Culturel Al-Mouna. Tchad: "Conflit nord-sud": Mythe ou réalite? , 1996. Chapelle, Jean. Le peuple Tchadien: Ses racines, sa vie quotidienne et ses combats, 1980. Decalo, Samuel. Historical Dictionary of Chad , 3rd ed., 1997. Feckoua, Laoukissam L. Tchad: La solution fédérale , 1996. Fuchs, Peter. "Nomadic Society, Civil War, and the State in Chad." Nomadic Peoples 38: 151–162, 1996. Hallaire, Jacques. Naissance d'une église Africaine: Lettres et chroniques du Pays Sar, Tchad (1952–1989), 1998. Nolutshungu, Sam C. Limits of Anarchy: Intervention and State Formation in Chad , 1996. Owens, Jonathan, ed. Arabs and Arabic in the Lake Chad Region , 1994. Tubiana, Marie-José. Women of the Sahil; Chad-Sudan: Reflections , 1994.
thank you so much i have a assessment task due soon and i just had to put a few finishing touch's to it! thank you again! I really love that you guys have this information up but I cannot use it unless it has an author. So I would really appreciate it if you guys gave credit to the person who put all of this together. Thank you for the authentic information I received on my Country! It has help to upgrade my Doctoral dissertation as I was doing cultural analysis. But only that I needed update record for bibliography. I am grateful!!! THANKS IT REALLY HELPED WITH MY REPORT ON LE TCHAD FOR FRENCH CLASS!!!!!!!!!!!!!!! Thank you so much for the information! I have a project due tomorrow on Chad and this really helps! haha, its just too bad I didn't find this page earlier in my research, I could have written almost all of my report with this one page! Once again, thankyou to whoever put this together. This was really great information i couldnt have done my homework without it! this is great work.thanks much. i just passed world geo. THANKS THIS REALLY HELPED WITH MY REPORT ON LE TCHAD FOR FRENCH CLASS!!!!!! thaaaank you! this really helped me research for my project. This is exact information I needed for to back up my Doctoral thesis. I respect people that provided those things on the next. What described here is as if you are residing in Chad my beautiful coountry. I love you! Thanks.. I just received 4 students from Chadian refugees camps. I am very grateful for the background information. i saw some formations in chad while viewing google earth that had round rocks in different formations kinda in circular shapes with designs all around the peremiter. does anyone know what they are?? this may help me pass socials let the world hope i dont wanna re-due that class! chads country is very poor also it does not have a lot of mineral resources i love this country alot that is why i'm doing a report on it but my grand daddy grew up in chad and it is a really interesting place! how do you cite your website in MLA format? I'm doing a project on tchad and i can't find the information i need to cite the websites on tchad. I'm living in Malaysia. I have been looking for information about my country which i know little about for months now. But i couldn't find anything so complete like that. Thanks a lot. I bookmarked this page for further needs. Thanks for the information. I have a project due and I really needed some pictures to include with it. Thanks so much to the person who made this site, collected the information, and assembled it I really needed it for a report on Chad. Cool. Really needed this for a project, its almost done with this. Thanks to the author. how do they celebrate there culteral celebrations? what can i find in a normal house in chad? This article is suprisingly indepth and helpful in my research. However, in order to incorporate it into an article which I am writing, I would really like to be able to add the author/s to my reference list, not just the website. Please provide this information! This Info. Was Really Amazing To Know & Read About ! It Really Helped For My School Project ! Thanks Guys ! Thanks for the information. It's very complete and easy to understand. This will help me a lot for my African Studies class. I am doing a project for school. I am 8 years old and in grade 3. We need to know the difference between schools in Chad and Australia. What time do you start / finish school. Do you wear a uniform? Good Work People! I liked the website might use it more often! thanks! I like this site..thank you..it really helped me .. will use this website a million times 4 sure.. Thankx again. thanks for the info i will use this for my seventh grade social study project. thanks about the info guys it really help. But I would like to know the defferences between North and South devides based on agriculture; life expectancy; education; unemployment and standards of living. i luv this place got lot of info here im very pleased with the info. Thank you for this very wonderful website that provided me with great information on my History project. I appreciated all of the pictures and it was very helpful. Thanks for the info and who is the author for the article on Chad and Medicine? This seriously helped me so much on my world geog. Project! I think the author's name is Jon G. Abbink. It says something like that after the bibliography. PS: This website is awesome! I'm happy to see all information about my country, good job guys,thanks. This A Very Helpful Site But I'd Like To See More History About Chad. That helped a lot im still doing resherch on chad and its my main sorce of info. This really helped me with my summer research project! Thanks a ton! This stuff REALLY helped cause, like, I'd gone to google and it showed me stuff abt libya and namibia! I am grateful for the helpful informations in this article aboutr my country. I am from the N'gambaye etnicy,but was never aware of my cultural background. This article is not only well-worded. It's trustworthy and a great resource for research. Who is that idiot who commented about Chad's lack of natural resources and minerals? What do you call the oil in Doba and the minerals in the North? We are a very wealthy nation but have been ruled by tyrants. Thanks again for this remarkable work! This really helped me. I have a huge project for school (I mean huge) and I needed A LOT of information. This article is really lonf and will probably help me finish most of it. Thank you everyculture.com! hi am very happy tolearn more about my cultural diversity in my country,otherwise i would like to let you guys know that Chad is a country of solidarity i mean (chadian people always share thier food together in one plate and its a big shame to see a man eating alone without his family,parents/friends in Chad) plus the chadian soil is extremly rich in both site north and sud we have petrol,gold,agriculture,mineral,and animal potentiality with different espece. Am also gr8ful of reading and learning the background info of Chad. I choose Chad as the country i'll like to present on. This was very helpful information but I never found out if Chad, Africa has any valley's. Thanks for the nice information.I am from North eastern part of Kenya,a district called Mandera which is inhabited by nomadic community called "the Garre".Since i was young i have been hearing rumours that my people(the Garres) are related to one of the main tribes in Chad.Apparently,the Garres are divided into two main clans called Tuuf and Quraan or quraanyow.Can this Tuuf be the Tubu of chad?.I need someone to help me know this information.I will really appreciate! I just want to say thanks to whome it may concern on this information I thought It was really good and that its gonna help me a lot on my research. hey.. im a grade 11 learner at lawson brown high school in South Africa. The university of Port Elizabeth has given myself and my partner plus learners of other high schools the task of doing research on countries in Africa. And we were given the country Chad, we want to be as accurate and thorough as we can.. So if some information of whether Chad is a party of the 2000 UN protocol and the traditional Chadian attire is available please let us know? We'd love to win this competition, your help would really be appreciated. I concur! ALl the info on this website is what helped me through my Essay, and without a doubt wouldn't have gotten an A without it...Besides that it's aloso just interesting in general, Thanks again!! Wow!!! This is a Very useful website!!! Thank You!!! Thank you so muc for the information. I live in London and my father is a Chadian but I have never been to Chad and therefore have no knowledge of my people or the culture and this has given me some insight of my father's culture which I am proud to say is mine too. My father passed away couple of years ago and I would like to go to chad and look for my roots and perhaps build a house there if possible. I would be very grateful if you could give me some idea of hoe best to plan this journey. I would also appreciate a comment from any Chadian living in London and reading this, as they can may be help me find my family. Just wanna thank the author for these corrects informations, as a Chadian im very happy to read all of you guys appreciating my cultures. Aisha im pleased to help you find your family here in Chad cuz im living down here and it will not be difficult to fin them. first of all thanks alot the author for the great info about chad, as well for me i have exactly the same story of aisha, but am living in jerusalem, i would like to be in touch may some day we can visit chad together,looking after our roots. Just I wanna thanks for all this information and we able to get knew about Chad news!!! Hi I am child from country, so I Thanks for everything's I was going to school in chad I am so Happy to staring class French to my country before I leave , to come Unite State, I tanksful for this, it has everything I could possible need for my Project and my Future Life For the great information about Chad African . Am from Northern part of Kenya particularly a blessed county calld Mandera. I heard that there is a community called Gurreh which divided into sub-tribe Wich is Tuff and Quran. .so I request real information about that. Thank you for this information. It's very nice idea. So i'm certainly everyone loves his/her country. I like my country very much. I'm happy to do chadian to. Now I'm in the another country but one day I come back God willing. I have not problem everything is good. I am so Happy and interested for reading this history of my country where by i am sure many people will little bit get some background about my beloved country Chad. and i wish more and more in order to let many people be aware of my culture and social life of my peoples. Long Live for My Chad, Long Live for Africa. I could not find anything about cultures that I needed for class.